This 20 minute workout will leave you feeling toned and sweaty! 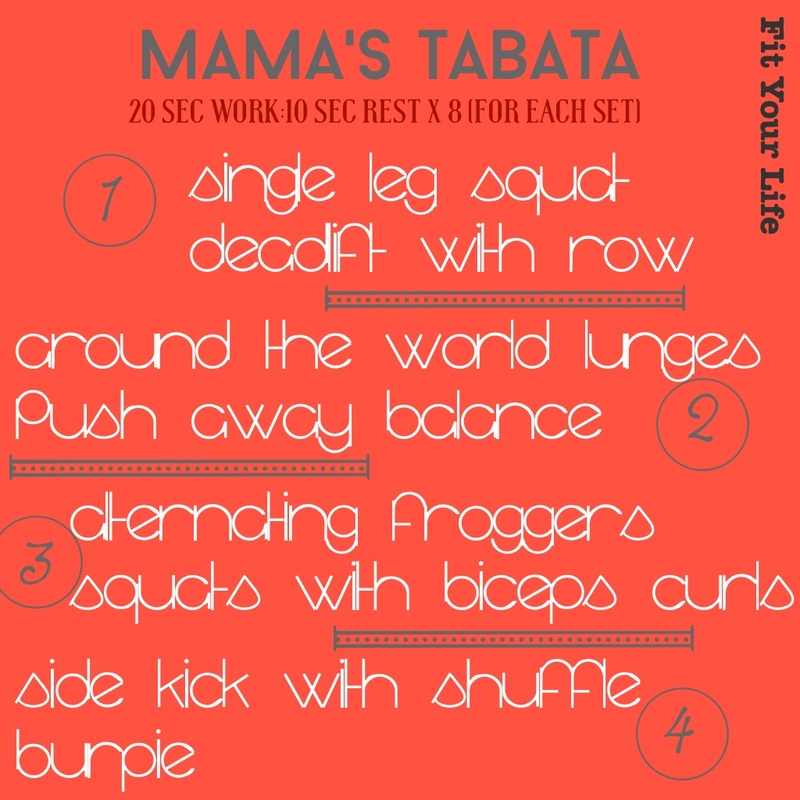 Tabata workouts are a great way to have an intense and efficient workout in a short amount of time. 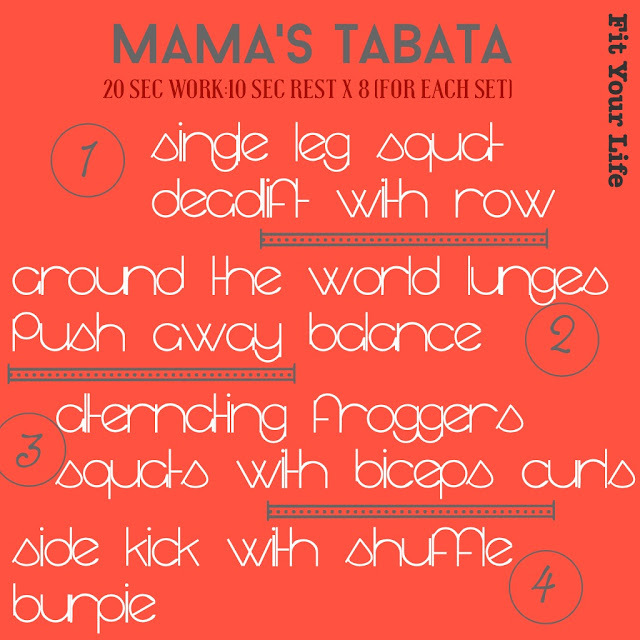 Despite the name of this workout, it is great for everyone and will challenge all fitness levels. You will complete each set before moving on to the next, starting with Set 1. Your timer will be set for 20 seconds of work with 10 seconds of rest x 8 rounds. You will alternate between the two exercises in each round to complete the 4 minute set (4 rounds of each exercise). Take a one minute break before starting Set 2. Continue this way until all four sets are complete! It should take you 20 minutes to complete ... 4 sets at 4 minutes each with a 1 minute break in between! Start with feet hip width apart. Lift right foot off the floor and behind you to balance on left foot. Bend through left knee and hip to lower your glutes back and down towards the floor. Stay engaged through your core and keep your chest high. Squat as deep as you can, then straighten through the left knee and hip back to standing. Complete entire 20 seconds on left leg. Switch to right leg next round. From a standing position, hold resistance band handles and stand on band (or dumbbells) in each hand with palms facing towards your body. With core and legs engaged, hinge at hips to lower resistance towards floor while keeping a slight bend in the knees. Bend from hips until your hands are near your lower leg. With core engaged and spine straight (looking slightly forward helps) lift your upper body back to standing position. As you stand up, squeeze elbows behind you to row resistance towards chest. Palms facing in and elbows pointed back. Squeeze shoulder blades together. Return to starting position. Repeat. Start with left foot in the middle of your mat. Right foot will step forward to perform a front lunge. Coming through the middle, then right foot will step out to perform a right side lunge (right knee bends while left knee stays straight). Coming through the middle again, step right foot back into a backwards lunge. There is always the option to touch your toe in the middle between lunges to find your balance. Continue all 20 seconds on the right side. Switch legs next round. Start in a single leg squat position. Bend through standing leg to lower your hands towards the floor. When palms reach your mat, bend elbows to lower into a mini push-up (hips will stay high and remain balancing on one foot). Press through palms and engage through core to return to standing. Continue entire round on the same side. Switch legs next round. Prenatal: Complete this exercise using a wall. It will resemble a plyo push-up, just balancing on one leg and on an incline! From a high plank position (hands on floor with wrists, elbows, and shoulders stacked and legs extended behind you) walk alternating feet to the outside of your hands. Keep hips low by contracting your abs through the entire movement. Step both feet on band while holding onto handles (or one dumbbell in each hand). Arms are relaxed. Bend knees to lower into squat position. Simultaneously bend elbows to curl handles towards shoulders. Return to starting position. Keep core engaged throughout movement. Start with feet wide than hip distance apart and bend through knees to engage legs and core. Do a walking shuffle to the right (right foot-left foot) then perform a side kick with right foot. Walking shuffle to the left (left-right) then side kick to the left. Stay low through your legs and keep your core engaged. Continue to alternate sides. healthcare provider to exercise before completing this routine. What you need in your hospital bag?